Custom details and luxury abound in this striking traditional home with brick and siding exterior. An enchanting box bay window enhances the living room/study, which is connected to the two story family room via an out-of-the-way wet bar. The spacious kitchen features a convenient center work island and pantry. Note the handy laundry sink and extra cupboard space in the utility room. The master suite treats homeowners to extravagance with its fireplace, built-in shelves, tray ceiling, back porch access, dual walk-in closets, and splendid bath. 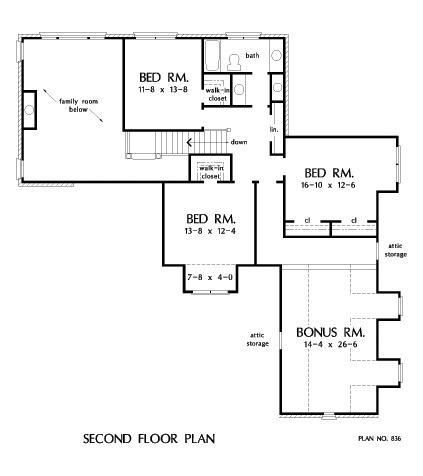 Three generous bedrooms with ample closet space, a full bath, and a sizable bonus room occupy the second floor. 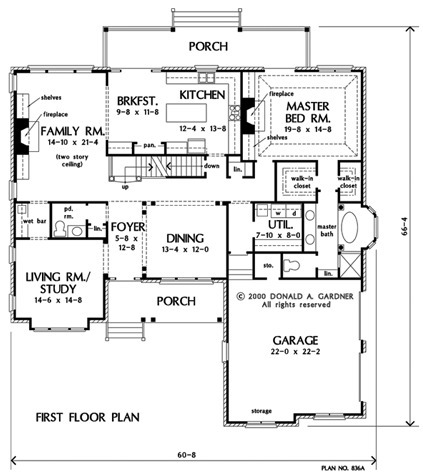 1st Floor: 2188 Sq. 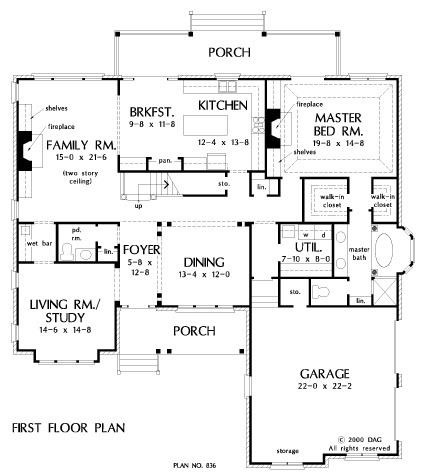 Ft.
House Dimensions: 60' 8" x 66' 4"
Great Room: 15' 0" x 21' 6"
Master Bedroom: 19' 8" x 14' 8"
Great Room (2 Story): 15' 0" x 21' 6" x 18' 0"
Kitchen : 12' 4" x 13' 8" x 9' 0"
Utility Room : 7' 10" x 8' 0" x 9' 0"
Bonus Room (Vaulted): 14' 4" x 26' 6" x 9' 0"
Garage : 22' 0" x 22' 2" x 0' 0"
Garage Storage : 4' 4" x 4' 0" x 0' 0"
Master Bedroom (Tray): 19' 8" x 14' 8" x 11' 0"
Bedroom #2 : 11' 8" x 13' 8" x 8' 0"
Bedroom #3 : 16' 10" x 12' 6" x 8' 0"
Bedroom #4 : 13' 8" x 12' 4" x 8' 0"
Porch - Front : 20' 2" x 7' 0" x 0' 0"
Porch - Rear : 34' 4" x 7' 2" x 0' 0"
Living Room : 14' 6" x 14' 8" x 9' 0"
Storage (Other) (Sloped): 9' 8" x 3' 4" x 0' 0"
Other : 5' 8" x 5' 8" x 9' 0"
Foyer (Flat): 5' 8" x 12' 8" x 12' 0"